This has to be just about the prettiest boat in Paul Fisher's collection - but please do look at the pictures on his site before you go ahead and build one! He clearly shows it being paddled with a double-blade paddle and sitting. Alhough this gives rise to a wet bum, it really is the only way. I had a pleasant time, in reasonable breeze, with a single blade sitting, but double would have been better. Kneeling, eeven very low kneeling, gave me an acute atack of the wobbles - although it has to be acknowledged that I'm not the most experienced paddler - others might have more luck. I'm thinking of adding a deck and cockpit to make it even more "traditional" - and drier! But it still draws smiles from onlookers, and I don't think it's because of my antics! 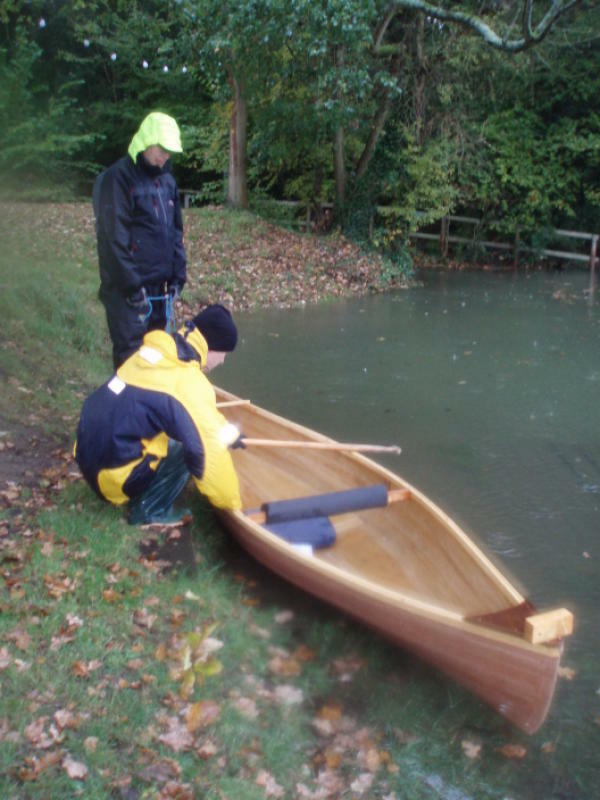 The Little Kate is modelled on a 19th Century classic by one of the great boat-builders of modern canoeing... and it was (as most such boats were in that era) designed for use with a double paddle! Finding a good photo of one can be a little challenging. Someone should be able to do better than this. This is all part of open canoe heritage - arguably more so than most of the modern tandem boats we see in the UK!